Long life due to dust protected ball bearings. 820 W powerful motor makes grinding and cutting operations run smoothly runs at 11000 rpm making all grinding operations easy and fast. Ergonomically designed with perfect body grip. Operated on both single and 3 phase. Very very good , very useful. I purchase it for littlebit home need, amazing quality product .. Build quality is awesome, ergonomically designed with perfect body grip. Very good product at very good price. The product is good and is easy to use. I’m using it in commercial purpose, really it provide amazing result in according to my expectation. Overall a best product. One could blindly buy it and would never regret. Ease of usability and user friendly functions make it a good choice for self use. I loved this angle grinder just because it is handy. Used this to buff up and polish my car by attaching accessories. 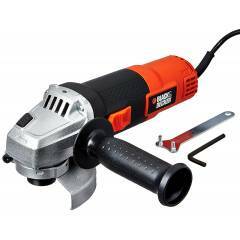 Black & Decker operations easy and fast ergonomically designed with perfect body grip. Safety Guard Side handle Back flange and locking nut.